The original source of the recipe below is located here: Spicy Cocktails to Spiced Chocolate: #SpicyChat is Cooking a 3 Course Dinner with Chilies from @exceptionalfood. We reproduce it on this page in its entirety for your convenience. Since my trip to King Arthur Flour in Vermont, I have been obsessed with baking, creating both savory and sweet deliciousness. An Empanada is a stuffed bread or pastry traditionally fried or baked with stuffing ranging from meat, cheese, vegetables, and even fruits. 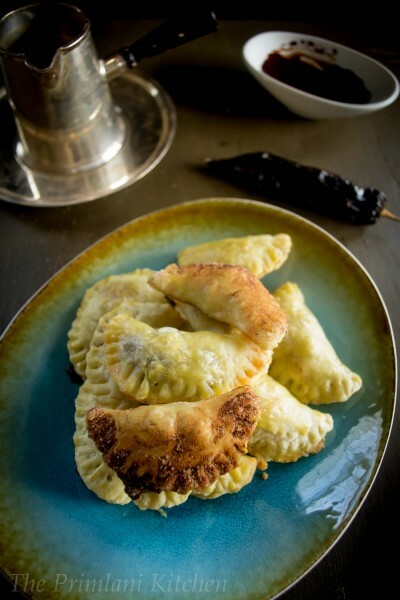 Different countries create their own unique version of Empanada – Calzone in Italy, Samosa in India, Dumplings in SE Asia, pastelillos in Cuba. Here to showcase the versatility of chili, I am combining a pastry like dough with a aji panca spiked chocolate ganache. And since I am not a fan of frying and also to showcase the flakiness of the crust, I chose to bake these empanadas. 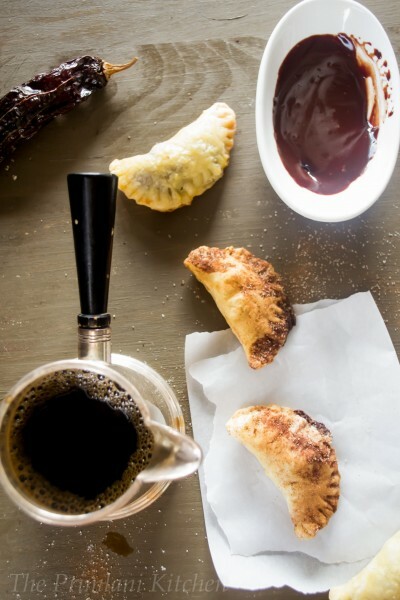 These spiked chocolate empanadas are surreal. They will wow your guests leaving their palates lingering with the hint of that ‘secret’ ingredient (spicy chocolate ganache). Aji Panca is one of the most common types of aji (chili) in Peru. Distinct from the other ajis in its spiciness, Aji Panca is mild in heat intensity (a heat level of 2 on a scale of 10; 1,500 Scoville units) and provides a fruity, berry-like flavor that goes well in stews, sauces, and fish dishes. Aji Panca is so sweet, so berry-like, that it can be finely chopped or ground into a powder and tossed into foods to add a sweet, mild heat. Make the empanada dough and chill for at least 30 minutes to overnight. To make the chocolate ganache, gently heat the cream, aji panca, and cinnamon over medium heat. Once it starts boiling, remove from heat. Add the chocolates and vanilla essence. Whisk to blend the ganache. Once smooth, add the orange flavored liqueur and cool completely. Refrigerate overnight. Lightly flour a rolling-pin and counter. Roll the chilled pastry dough into 1/8 of an inch dish or rectangle. Using a 4 inch cookie or biscuit cutter, cut out circles of dough. Re-roll the scraps and continue making circles until the dough is used, approximately 20-25. Spoon 1 tsp of filling on each circle. Apply egg wash on the edges of the border. Fold the dough over in half to enclose the filling and form a semi-circle. Tightly seal the edges by crimping with a fork. Place the empanadas on a parchment lined baking sheet and brush the tops with egg wash.
Chill for 15 – 20 minutes in the refrigerator. Bake for 18-22 minutes until the pastry is golden brown. Let rest before you bite into it the melting and gooey chocolate.